Why Are VLTs So Addictive? Called the crack cocaine of gambling for good reason, video lottery terminals (VLTs) seem uniquely addictive – and VLT addiction happens fast. While gamblers betting on sports, horses, or on perceived games of skill (such as poker) may take decades to progress to pathological gambling; VLT players can make this tragic journey in under a year. Completely unregulated in most states, no one was prepared for the social devastation unleashed by the proliferation of VLT gaming. Countless stories of tragedy, financial ruin and suicide linked to VLT have made their very existence controversial, yet they remain widely available for play in many jurisdictions. VLT gamers play for an analgesic escape. They play to forget about problems, anxieties or any other negative emotions - They play VLT's in the same way an alcoholic drinks to forget. By contrast, action gamblers (those who play games such as poker or bet on sports) chase the thrill and excitement of the wager. This seeking of escape through gaming induces an almost narcotic and trance-like state, and this hypnotic and narcotic trance is very addictive to the escape gambler. 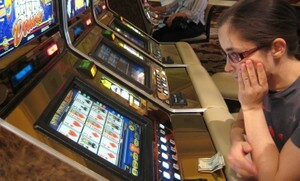 More women than men gamble to escape, and all escape gamblers play fairly mindless and repetitious games, such as those offered on VLTs. VLT gamers may bet 10 or more games per minute; VLT machines offering unparalleled speed of play and quickness of reward – and this rapidity of bet/reward increases the addictive properties of VLT play. The quicker the pleasurable stimulus after an action, the more habit forming or addictive that action can become. Just as crack is more addictive than cocaine partially due to it's speed of onset, VLT gaming is more addictive than other forms of gambling due to this speed of play. The more time spent gaming, the quicker the progression of addiction. only while the casino remains open for business. Additionally, gambling regulations in most jurisdictions limits the time any one player may game in succession. VLT gaming offers round-the-clock access, usually only minutes from the home - 24 hour a day play, with no limitations set on duration of gaming and with machines in hundreds of easy to access locations throughout most towns. The lights and sounds of a VLT can induce a trance-like state, particularly for someone playing over long periods of time. This trance-like state increases the analgesic effects sought by the escape gambler – increasing the addiction. Although now widely recognized as socially destructive, VLTs generate enormous taxation revenues for local and state governments, governments now too reliant on these revenues to seriously limit access to play. Play VLTs only with extreme caution and awareness, if at all.